Polyurethane foams – PU foams for short – play a big role in our everyday lives, even if we are generally not aware of them. We sit and lie on them every day: car seats and mattresses, for example, are made of soft PU foams. Hard PU foams, on the other hand, are used among other things for insulation materials in buildings. Predicting the properties of foams and characterizing them is very complex – experimental analyses often lead to false parameters. Of particular interest are the following questions: How does the initial liquid transform into foam? And what are the characteristics of the foam created? Researchers at the Fraunhofer Institute for Industrial Mathematics ITWM in Kaiserslautern are now able to reliably answer these questions and provide manufacturers of PU foam products with a good characterization of the polymers used, making it much easier for them to plan new product lines. This is best explained using an example, such as a car seat. In this case, some areas are meant to be harder and others softer. Manufacturers achieve this by injecting foams with different characteristics against each other. They use liquid polymer blends as their starting materials, which are injected into a suitable mold: a rapid but complicated chemical process begins. Within a few seconds, the two liquid emulsions transform into a complex polymer foam. But how exactly do the two different substances foam? Do they have the required properties, and do they spread as intended into their proper zones? « Instead of starting with chemistry and experimentally determining all parameters such as reaction rates and viscosity in many independent experiments, we do two or three simple experiments – such as foaming in beakers, » explains Dr. Konrad Steiner, head of department at Fraunhofer ITWM. « We simulate these experiments one to one on the computer. These experiments serve to establish the model parameters needed for the FOAM simulation tool, which calculates foaming behavior based on simulations. The results are robust and reliable for the specific application. » Instead of determining each characterizing parameter separately in an individual experiment, which can lead to imprecise values, researchers can now quickly obtain reliable data for the foaming process with a minimum of effort. « Manufacturers usually work with three or four different foams – for new products, they generally just change the combination of foams and the end geometries, » says Steiner. Once the Fraunhofer researchers have characterized a PU foam through simulation, this provides a good starting point for new products. 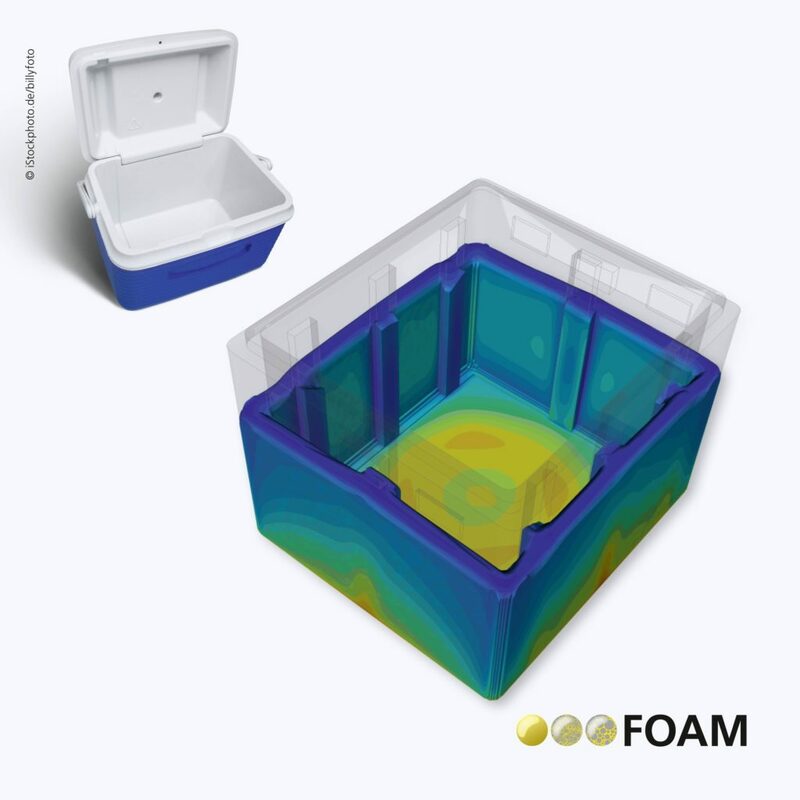 Manufacturers can input the foam data they receive into the FOAM simulation tool and simulate for each new product and each new geometry how the foam mass and heat should be transported during the foaming process. In the case of a car seat, they can find out exactly how to inject the two foams against each other to achieve the desired zone properties at the right places. The simulation methodology for identifying parameters and simulating foam with the FOAM tool has been established, and several projects are already underway with various customers. Manufacturers often rely on PU foams in composite materials, such as those used for support structures in cars, which must be stable yet lightweight. Here, other reinforcing materials such as textiles are integrated into the foams. Whereas a rigid foam sheet might break if forced to bend, a sheet with integrated textiles can easily withstand these forces. The flow behavior of the polymer emulsion changes, however, as the textile structure in the mold naturally acts against this, leading to changes in the dynamics of foam formation and the structure of the foam: the bubbles get smaller, the foam gets denser. The researcher team at Fraunhofer ITWM, together with colleagues from the Department of Lightweight Structures and Polymer Technology at TU Chemnitz, have developed the first ever simulation for composite materials. « We are able to calculate the flow resistance caused by the corresponding textile structure, which is an expertise that we have possessed for some time now. Subsequently, we can simulate how foaming takes place in and around the textile structure, » explains Steiner. Manufacturers have previously had to laboriously test whether the foam composite had the required properties – a process that could last weeks or even months. By contrast, the simulation comes up with a reliable result within a day or two. The researchers have already validated and tested the results on components and established that they match up very well with reality.